Launching a ship requires a goodly crowd and a large bottle of champagne. Exactly the same principles apply to book launches, though without all the sea-water. I’ll skip the question of whether you “need” a physical launch. I didn’t have a launch for any of my non-fiction books, unless you count one publisher’s lavish effort with a bowl of peanuts and about three people. Here’s what I learned from the launch of my novel Hampstead Fever earlier this week. 1 My best tip: share the launch with another author. But no sailing under flags of convenience. You must like the other author and their book. I shared Wednesday evening at Daunt Books, Hampstead Heath, with my fellow author Christine Webber. It was her second novel and my second novel, and we’d both had around 12 non-fiction books published already. While Who’d Have Thought It? 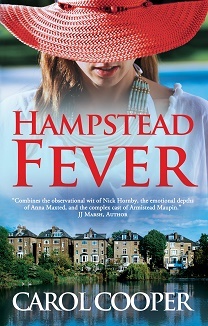 isn’t much like Hampstead Fever, it’s in the same genre and both make good summer reads. 2 Invite people because you like them, not just because they’re “useful”. The second type has a disconcerting habit of finding something more interesting to do on the night. Besides, you’re celebrating your achievements, so you should enjoy the proceedings. 4 Have plenty of food and drink. Especially drink. If you can, have someone to serve people wearing white gloves. Class. 5 Take a pen. Of course you’ve already practised your authorial signature and worked out what to write by way of dedications, but something to write with does come in useful. 6 Get someone to take photos. Even better, ask several people, just in case. Make sure they capture the really important shots, eg with your family. 7 Say a few words about yourself and your book. You might mention the drawers full of unpublished masterpieces, or explain why you write instead of doing something easier, like transplant surgery. Thank key people, but remember it’s not an Oscar acceptance speech. Five to seven minutes will do, especially if more than one person speaks. Christine and I didn’t do readings, but many authors do. At a recent multiple launch, authors from the Triskele collective had others read excerpts aloud, to great effect. 7 Consider getting someone to introduce you and/or field questions from the audience. Someone might want to know how you write (“Is it true that you do your best writing in a rainy orchard with nothing on?”) or whether that scene is based on real life. On second thoughts, skip the questions. 8 Consider merchandise (bookmarks, pencils and other trifles) or a draw for a book-related prize. You could also have a slide-show or a book trailer running. The sky’s the limit, really, but it can become tacky, look desperate, or interfere with sheer enjoyment of the event. Concentrate on essentials like chilled fizz and plenty of copies of your book, and you’ll have a great send-off for your new title. « Don’t Use a Semi-Colon. Period. Congratulations on your novel and launch! Thank you very much, Charlie. I hope you get a chance to enjoy my new novel. Thank you, Caz. Much appreciated.